Globalstar's fleet of orbiting communications satellites received reinforcements Tuesday, when a commercial Soyuz rocket launched from Kazakhstan and deployed six advanced spacecraft to restore the company's diminished two-way voice and data services. A Soyuz rocket lifts off with six Globalstar communications satellites. Built by Thales Alenia Space, the satellites are also the cornerstone of a rejuvenated Globalstar constellation. Three more Soyuz launches are planned through the summer of 2011, bringing the company's fleet of second-generation satellites to 24 platforms. Globalstar officials say the transition to the new satellite fleet will be seamless for the company's 400,000 subscribers, except for a marked improvement in mobile two-way communications service. By the middle of 2011, Globalstar officials say customers can expect a return to reliable voice and data transmissions. Until then, subscribers can use an application on the company's website to plug in their location and determine what hours satellite coverage is available. "It's a tool we developed for those customers who really wanted to send voice and data from rural locations, and they would have no frustrations in hitting that send button," said Tony Navarra, president of global operations at Globalstar Inc. of Milpitas, Calif. But regular Globalstar users can expect to see gradual service improvements with each launch. "There will be an immediate improvement on each of the launches," Navarra said. "A month or two even after this first launch, they will start to see improved services." A Soyuz rocket launched at 1710:59 GMT (1:10:59 p.m. EDT) from the Baikonur Cosmodrome in Kazakhstan. Soaring into a partly cloudy night sky, the Soyuz 2-1a booster and Fregat upper stage accelerated to orbital velocity a few minutes after liftoff. After coasting around the world for more than an hour, the Fregat upper stage ignited again to reach the planned separation orbit. The rocket was targeting a circular orbit 572 miles high with an inclination of 52 degrees. Mounted on a specially-built satellite dispenser during launch, the Globalstar spacecraft were released in a choreographed sequence to avoid collisions. Two satellites bolted to the top of the cone-shaped adapter separated first, then four craft on the lower portion of the structure deployed 96 seconds later. The satellites' first radio signals were received by ground stations moments after spacecraft separation, according to Jean-Yves Le Gall, chairman and CEO of Arianespace, which oversees commercial Soyuz launches through its Starsem subsidiary. "This launch is a direct result that Globalstar has once again reaffirmed in Arianespace and Starsem," Le Gall said in a post-launch speech. 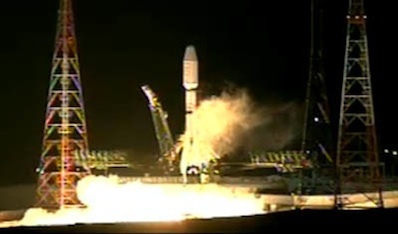 It was the ninth Globalstar launch on a Soyuz rocket since 1999. "Thales Alenia Space is very proud to contribute to your success," said Emmanuel Grave, executive vice president of telecommunications at Thales Alenia Space. "We are very pleased by this launch of six new satellites for the Globalstar constellation, and we are looking forward to the next three launches and wish the best to the Globalstar company." In a phone interview from Baikonur on the eve of launch, Navarra said two of the satellites launched Tuesday will enter service in about one month. It will take up to four months for the other four craft to drift to their prescribed orbital locations. Thales is preparing 18 more satellites for launch on three Soyuz rockets next year. Navarra said the next flight is scheduled between January and March of 2011, then the final pair of launches will be at two-month intervals in the spring and summer. Globalstar's existing 40-satellite constellation is mostly comprised of spacecraft launched between 1998 and 2000. Built by Space Systems/Loral and designed for a seven-and-a-half year orbital life, the satellites are aging and need to be replaced. "We slowly move the older satellites out of position in their orbital plane as we move brand new satellites into place," Navarra said. "We will be taking those 40 satellites slowly out of place and move these new ones in six at a time." The new satellites weigh 1,543 pounds at launch and are supposed to operate for 15 years, extending Globalstar's constellation life through at least 2025. 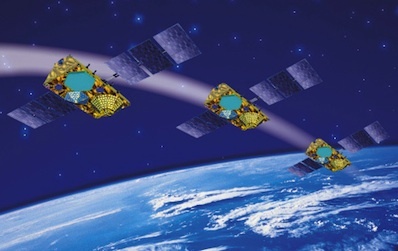 When the Globalstar launch campaign ends next year, the company's fleet will include 24 second-generation spacecraft and eight leftover first-generation satellites built as spares and launched in 2007. "We're going to marry the 24 satellites with the eight already in orbit to have a 32-satellite constellation," Navarra said. Globalstar's contract with Thales includes an option for 24 more satellites, bringing the possible second-generation total to 48 spacecraft. According to Navarra, Globalstar will consider exercising that option late next year completing the current flurry of Soyuz flights. "As we complete the final delivery in the second quarter of 2011, we'll start looking at exercising our options to build the next 24 (satellites)," Navarra said. Globalstar invested $1 billion in the satellite construction and launch campaign. Assuming the company taps Thales to build an additional 24 satellites, the average cost of each spacecraft is about $15 million, according to Navarra. The company is also installing a next-generation ground network to support increased data speeds and enhanced features such as push-to-talk, multicasting, multimedia messaging and other services. Globalstar expects the ground systems to support these products to be ready by 2012, according to a press release.